Course is one of the most widely used words in Higher Education - by students, higher education providers, policy-makers and funders - and as the funding and structures of Higher Education change, there is an increasing demand for information at the level of individual courses. 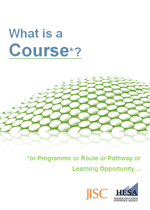 HESA, working with representatives from the sector, is pleased to publish What is a course, a brief report that considers the variety of interpretations and models that exist across the sector. The report analyses how the concept of a course is represented in various sector-level information systems and specifications and how the definition of course changes across the Higher Education lifecycle. The Course report has been undertaken with the support of the Joint Information Systems Committee (JISC) as a part of the Course Data programme . Queries about the Course Report should be directed to Andy Youell at HESA.